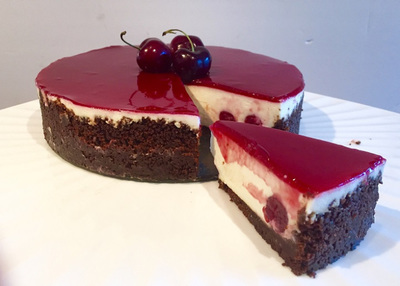 I made this cheesecake for Christmas Day and it was a winner. 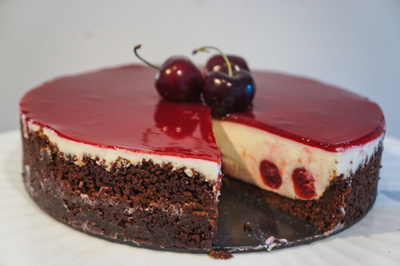 The combination of a chocolate biscuit base with creamy filling and a cherry topping made for the perfect black forest flavour. It isn't that hard to prepare and it presents so nicely! Well worth it for any occasion. Process biscuits until mixture resembles fine breadcrumbs. Add butter and process until combined. Using one hand, press mixture in to bottom and sides of a 21cm springform cake tin. You can use the bottom of a glass to smooth it out and up the sides as well. Cover, refrigerate for 30 mins. Meanwhile, make the filling by beating the cream cheese, sugar and lemon juice in a bowl until smooth and creamy. Sprinkle gelatine over the water in a small heatproof jug. Stand jug in a saucepan of simmering water. Stir until gelatine dissolves and allow to cool for five minutes. Whip cream until soft peaks form and food in to cream cheese mixture. Fold in gelatine mixture. Drain cherries and reserve 3/4 cup of syrup for the topping. 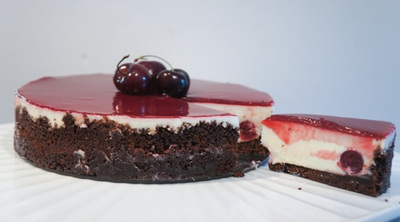 Spoon on third of cheesecake mixture over biscuit base and top with half of the cherries. Repeat the layers ending with the cheese mixture. Refrigerate for three hours or overnight until set. Make the topping by blending cornflour and sugar with reserved cherry syrup (3/4 cup) in a small saucepan. Stir over medium heat until mixture boils and thickens. Stir in rum. Cool for 10 minutes before using. Spread topping over cheesecake. Swirl gently in to cheese mixture. Refrigerate until set.